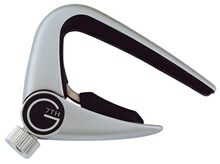 The G7TH is a light weight and a low profile, modern capo. The Newport is a fast, accurate capo with in-position fine tune adjustment on the fretboard of your instrument. An advancement over existing capo designs, the Newport's refined adjustment means that only the right amount of pressure needs be applied to clamp the strings - which improves tuning problems without the loss of sustain associated with the thick rubber of other capos. It's classic G7th styling will also look great on your guitar!